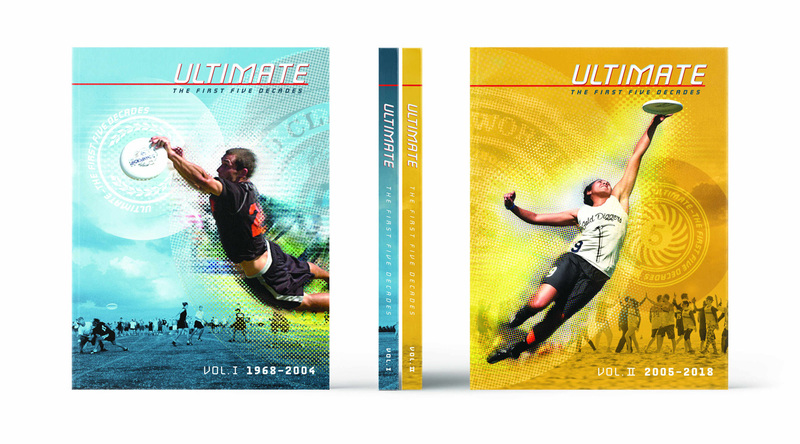 ULTIMATE--The First Five Decades | Ultimate Frisbee History in U.S. Both books will begin shipping in late May. Allow 2 weeks for delivery. PayPal charges your account when you order. Cannot ship to a PO Box. No international shipments at this time. Sorry. The first volume is a reprint of the highly acclaimed first history book, ULTIMATE – The First Four Decades, highlighting the history of ultimate from 1968-2004. The new, second volume is a continuation of the first book, highlighting how ultimate has advanced from 2005-2018 and looking toward what is in store for the future of the sport. You may be surprised how much you didn’t know happened… or at least the details you didn’t know about. And of course it covers much of what happened on the field especially at the National Championships. Over 600 players and over 200 teams are highlighted plus a huge gallery of the best photos taken over the past 14 years is included. Additionally, a third book, Vol. III, covering the history of the Disc, Rules & SOTG and the Hall of Fame will be published as an eBook in late-May 2019.
Who Created Vol. II and III? It takes a village to publish books like these. Fortunately the ultimate community is the perfect place to ask for and find all the help you need. I hope you like how the book looks because it takes amazing talent and a huge amount of effort to produce a great looking coffee-table style book. And Jason Wedekind is the perfect guy for the job. His company Genghis Kern Letterpress & Design in Denver is a ‘magic shop’ where ideas go in and beautiful results come out. I also hope you like all the photos in the book. You wouldn’t believe how much time, effort and creativity it takes to find and select them. But the ultimate village had the perfect person – William ‘Brody’ Brotman. Then comes the work to smooth out the chapters so the book tells an interesting story rather than seem like unconnected bits of writing. That’s the job of the editor. Steve Sullivan has been doing it for a long time, and this book benefitted from his talents. Before the book is ready for the printer, the technical work of finding all the errors falls on the copyeditor and finally the proofreader. Elisabeth Bowman is the best copyeditor I’ve ever known. And Madeline Barbier was a real find to do the final proofreading. Last comes the index thanks to the team at Scholarly Indexing. Please join me in thanking all these people. But before you turn the page, there is one more group in the ultimate village that made this book possible – the financial backers. Without Andrea ‘Andy’ Cummis, Chris Fletcher, David Leiwant, Doug Propp, Robert ‘Nob’ Rauch, Dan ‘Stork’ Roddick, Henry Thorne and Geoff West these books would not exist.